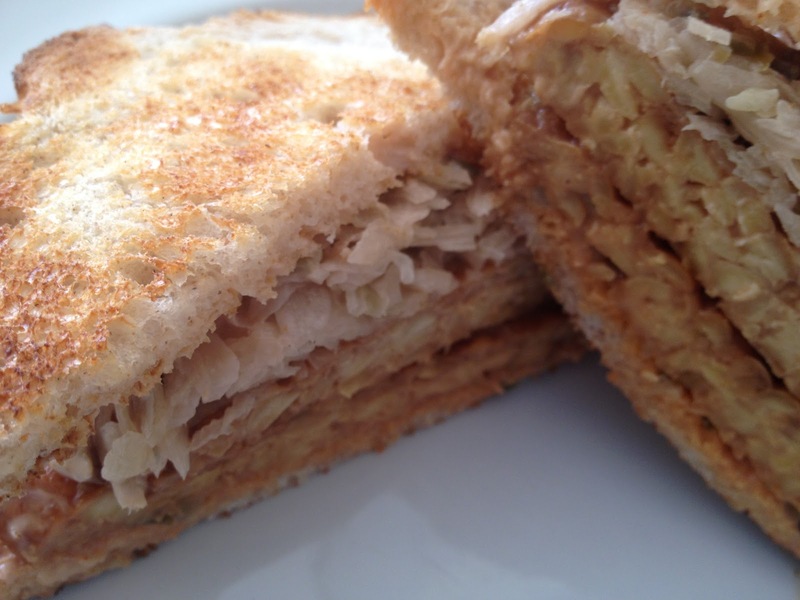 My friend Jill says I make the best Tempeh Reuben in town: tempeh, russian dressing, and sauerkraut on sourdough bread. Make the tempeh beforehand or right then and there. Either way, a quick, easy, and delicious lunch. To make the dressing, mix veganaise, ketchup and relish together. Make as much as you want. Toast the bread. Spread the russian dressing on the toast, layer on two squares of tempeh, and top it with tons of sauerkraut. Voila! Enjoy! Pour the apple juice and tamari in a pan with sides. Whisk together. Cut the tempeh in half and then cut the halves in half again, slicing through the thick end. Place the tempeh in the marinade and swish it around. Bring it up to a rolling boil and let it simmer for at least 10 minutes. Flip the tempeh over and let it go another few minutes.